The Russian defence export company is offering a wide range of products to all three wings of the Indian armed forces at the defence exhibition, which begins on February 6 in New Delhi. Rosoboronexport is looking to expand cooperation with India and is focussing on joint production and development with the country, the Russian company said on Wednesday. “Expanding joint development and production efforts on weaponry and military equipment will be among the key topics during talks between Rosoboronexport and Indian partners,” at the Defexpo India 2014, Rosoboronexport said in a press note. Rosoboronexport said it would hold talks with Indian partners on current and future projects, including upgrading of previously delivered equipment, including the BMP-2 infantry fighting vehicles, T-72 and the T-90S tanks. The company added that it expects to discuss the progress of the tender to supply self-propelled artillery systems. “Among its contenders is the Russian upgraded Msta-S 155mm self-propelled howitzer, which is undergoing trials in India. The howitzer’s chassis has a high level of commonality for components and units with the chassis of the T-90S MBT, whose licensed production has already been mastered at India’s Heavy Vehicles Factory in Avadi,” the company said in the statement. The ongoing work on setting up a Russian-Indian joint venture to manufacture rocket projectiles for the Smerch multiple launch rocket system may be considered a promising new area for mutually beneficial cooperation on army weapons, Rosoboronexport said. 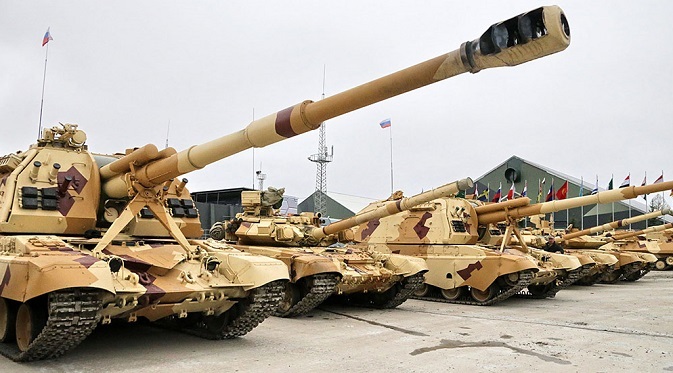 The Russian company said it expects India to be interested in the T-90S MBT, T-90S-based engineer vehicles, BMPT-72 tank support combat vehicle, Sprut SD self-propelled anti-tank gun, tactical automated command and control system among other offerings. After-sales service of the INS Vikramaditya will be among the naval issues to be discussed at the expo, the Russian company said, adding that it was ready to continue consultations to promote the Amur-1650 diesel-electric submarine within the upcoming tender for design and construction of the Project 75I submarines for the Indian Navy, as well as to supply an additional series of Project 11356 frigates. For the Indian Air Force, the Russian exporter is offering the Ka-226T light utility helicopter, which is a strong contender in the Indian tender to supply 197 reconnaissance and surveillance helicopters. Rosoboronexport, a subsidiary of the Rostec Corporation, is the sole state-owned arms trade company in the Russia authorized to export the full range of military and dual-purpose products, technologies and services.